My fascination with pre-code horror comics of the 1950s continues, enabled by PS Artbooks and their seemingly endless reprint volumes of that material. I read Pre-Code Classics: Mysterious Adventures Volume One [$49.99] over the weekend and it has earned a permanent place on my bookshelves. 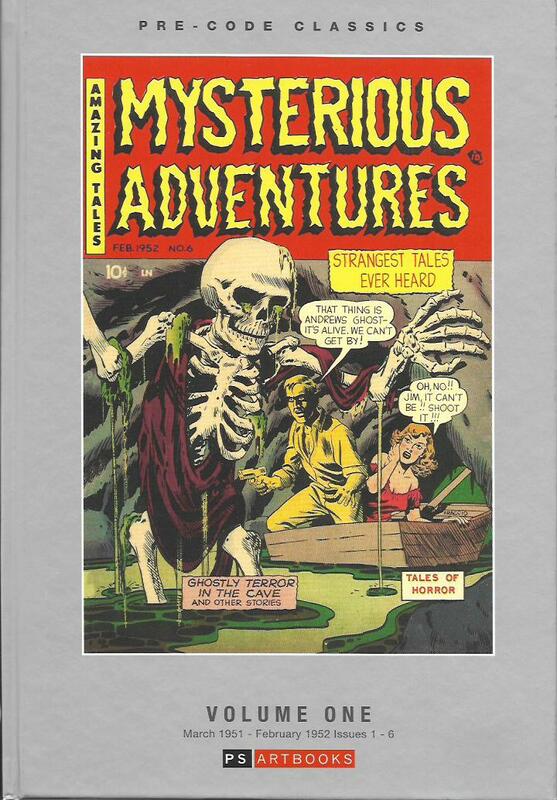 Mysterious Adventures ran 25 issues from March 1951 to August 1955. Though the issues didn’t carry any particular branding, they were published by Story Comics. This volume reprints issues #1-6 of the series. Writing credits for these issues are nonexistent. Artists have been identified for many of the stories, but a number of those identifications seem like a wild guesswork to me. The covers are fairly garish but not gory. Walter Johnson’s cover for the first issue is indicative of the story-driven nature of the covers. Strangely enough, that cover illustrated the issue’s prose story and not a comics story. Every one of these six issues has a small “Tales of Horror” blurb on the cover along with a reference to these being the strangest tales every heard. The stories have the usual vampires, monsters, witches, possessed killers and so on found in most of the horror comics of the era. Issue #1’s cover seems to have inspired an actual comics story for the second issue, making me wonder if it that second issue story was originally intended for the first issue. By the end of “The Cabinet of the Living Death,” the male and female protagonists have been reduced in size and turned into Ju-Ju dolls. They can’t move, but they are still alive. Several issues later, that shock ending is used again, but in even more terrifying fashion with a pair of illicit lovers turned into still-sentient shrunken heads. Another tale had a mother coming back from the grave to protect her daughter from her husband’s second wife. The mother’s spirit turns the second wife into a mad horse who is then shot and killed. The horse disappears and, when they find the second wife, she’s not just dead from a gunshot wound, but, near her body, is jewelry that had been buried with the first wife. I’d rate the writing in these comics a cut above the usual. The art is pretty good as well. Ed Goldfarb (pencils) and Bob Baer (inks) make for an intriguing team. We also get solid artwork from Alvin C. Hollingsworth, Lou Cameron, John D’Agostino, Bill Fraccio and Tony Tallerico. I’m getting more selective about these horror reprint volumes, but I’d recommend this one to anyone interested in the genre. I’ve been enjoying All-New Wolverine, the Marvel Comics title that stars Laura Kenney, the clone daughter of the original Wolverine. As X-23, she was created to be the perfect killing machine, was an assassin for an evil organization and eventually found her way to the X-Men and the road to redemption. She’s a terrific character and, save for when Wolverine is played by Hugh Jackman, I like her better than the original. Marvel’s overuse of Logan/Wolverine and its multiple incarnations of him have exhausted my interest in the character. I wish Logan weren’t coming back, but, alas, it isn’t my call and so All-New Wolverine will be ending. At least, Laura will be back for a fourth volume of X-23. 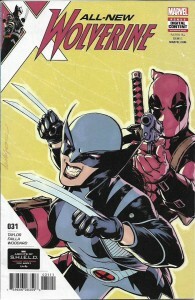 All-New Wolverine #25-32 [$3.99 each], the latest issues I’ve read of the title, were entertaining. At first, I was dismayed by issue #25-30’s “Orphans of X” because it seemed to be just another “self-involved super-heroes” tale, which I define as stories in which the heroes are fighting for themselves and not really to protect other lives. It sometimes seems like a majority of super-hero titles from Marvel and DC fall into this category. Writer Tom Taylor brought something else into the mix. Yes, Laura and other Weapon X Project creations are being hunted down by the surviving family members of people killed by Laura and the others. Self-interest, right? Yet, by the end of the six-issue arc, Laura has seized control of the conflict and redirected her efforts into helping the survivors get justice without killing her and the rest of the Weapon X alumni. That’s followed by two done-in-one stories that are still connected to the Orphans of X, one of them featuring a guest appearance by Deadpool. All-New Wolverine Vol. 5: Orphans of X [$17.99] collects the story arc by Taylor and artist Juann Cabal. I enjoyed it so much that I’m recommending it to you and making it my pick of the week. 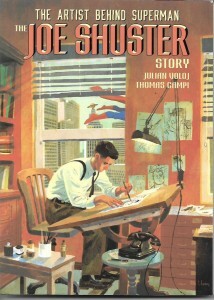 The Artist Behind Superman: The Joe Shuster Story by Julian Voloj and Thomas Camp [Super Genius; $19.99] back-cover bills itself as “The Secret Story of Superman’s Creation.” This graphic novel may not live up to that claim precisely – much of that story has been written about elsewhere – but does manage an occasional surprise along the way. The visual format also lends a different perspective to the story of the two guys from Cleveland and how they achieved their dream, fell from the heights and then regained at least some dignity, financial compensation and respect before the end. The focus on Shuster gives this book a perspective unlike the other books. Writer Jerry Siegel had always been the dominant partner in their collaboration. He came up with the basic Superman as super-hero concept and created the rudimentary world of their character. He was the one who fought, sometimes unwisely, for their rightful due. He was the one whose dramatics finally got the attention of the public at large. But Shuster is the star of this graphic novel and it reveals him as meek and mild as Superman pretended to be in his guise of Clark Kent. More than Siegel, Shuster seems to be the guy caught in the middle of the conflicts, going along with Siegel because of his loyalty to his friend and because he knew they were in the right. Shuster’s is a sad story. The downside of this otherwise excellent comics work is that readers don’t get to see the light at the end of the Superman tunnel. The book simply ends too soon. Even so, it is a keeper for fans of Superman and students of comics history. It includes a selected bibliography for those who want to know more, as well as over a dozen pages of notes. It should be a contender in next year’s comics awards.